Exhibition at Greg Kucera Gallery showcases artist’s visual oxymorons. Conceptual art — art where ideas, usually subversive ideas, are front and center — can alter the way you see the world around you. When conceptual art also has a lot going on in it technically, you get the best of both worlds. At Greg Kucera Gallery, “Chris Engman: Equivalence” explores startling concepts with a tour-de-force mastery of the Los Angeles artist’s chosen medium: photography. Engman’s work falls into two groups: trompe l’oeil illusions involving simple objects (a crumpled sheet of paper, a stack of cinder blocks) and more elaborately staged conflations of indoor and outdoor environments. Both produce extraordinary results. But his pigment prints in which man-made interiors (studios, apartment corridors, outbuildings) and sweeping natural exteriors (forests, deserts, seascapes) interpenetrate one another are especially dazzling. 10:30 a.m.-5:30 a.m. Tuesdays-Saturdays through Oct. 28. Greg Kucera Gallery, 212 Third Ave. S., Seattle (206-624-0770 or gregkucera.com). “Landscape for Quentin” has a doors-of-perception feel to it. 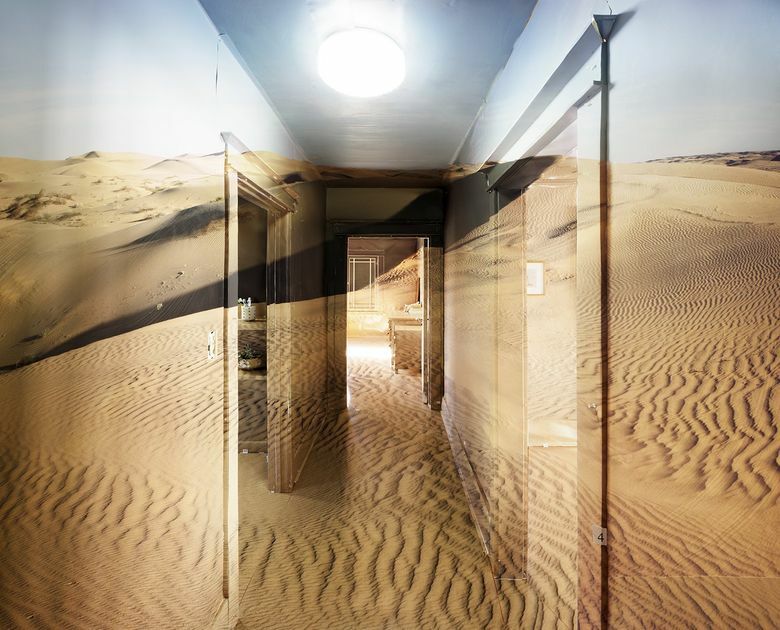 Rippling sand dunes become, in the center of the photograph, a corridor with a bright electric light overhead, a bathroom on the left and, in the rear, a sparsely furnished room. The very door frames are extensions of drifting desert sands. The image is at once architectural and organic: a visual oxymoron. In “Equivalence,” a corner room coincides with a vaporous cloudscape, creating a double-natured realm for the mind to inhabit. 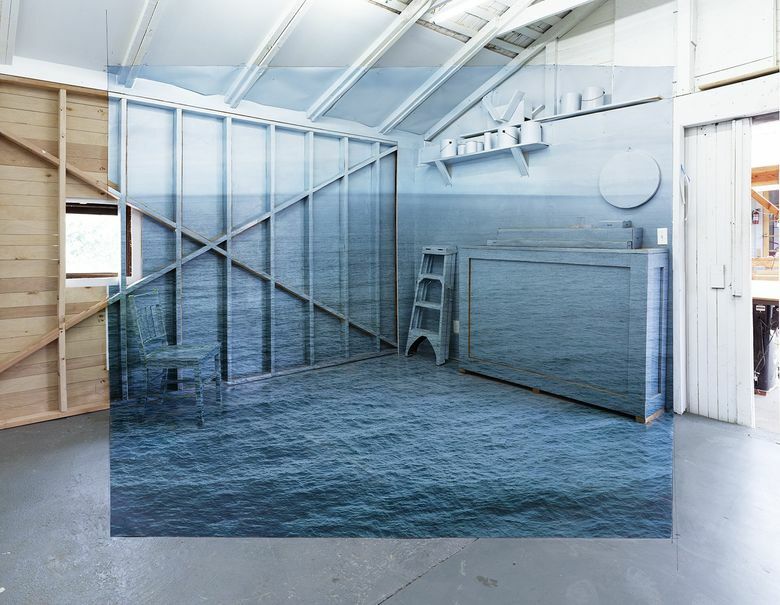 In “Prospect,” a seascape expands from within a toolshed. In “Refuge,” a house interior overgrown with scraggly woods confounds the eye. Engman isn’t indulging in trickery for trickery’s sake. His wildly hallucinatory work fuses both needs into a single vision. His trompe l’oeil pieces are less flamboyant, but still fascinating. It takes careful study of “Paper III” and “Cinder blocks” to convince yourself you’re looking at a photograph rather than a 3D installation. The photographs’ renderings of frames within frames create surprisingly persuasive pop-up illusions. Seattle artist Dan Webb, who had a spectacular retrospective at Bellevue Arts Museum a few years ago, is a wizard with wood — but his latest efforts show him venturing into other media, including glass. The strongest entries, “The Melted Chair” and “The Visitor,” are carved in fir, however. 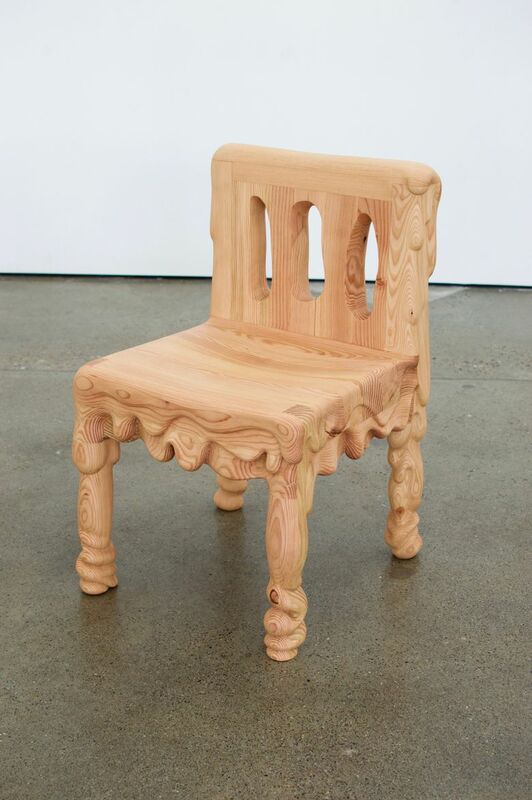 “Chair” is exactly what it sounds: an ingenious wooden rendering of a gloppy seat to sit on. 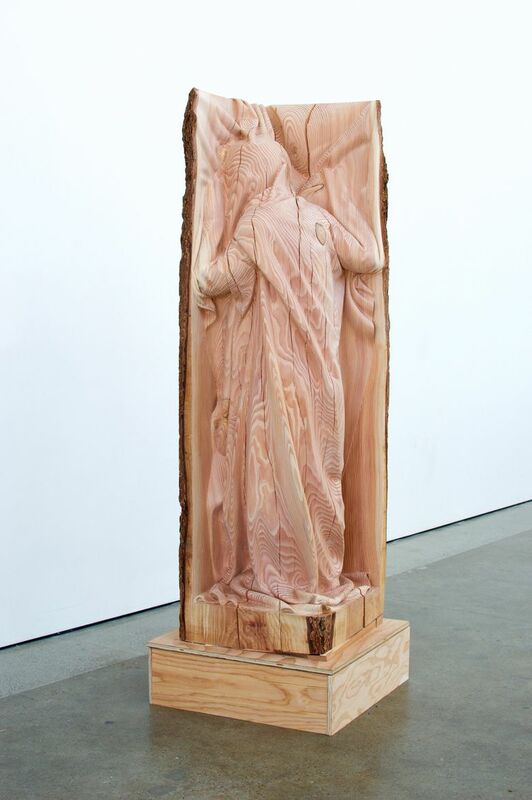 “The Visitor,” hewn from a huge tree trunk, contrasts crudely planed surfaces on one side with a sophisticatedly carved robe-draped figure melting into the core of the trunk on the other side. “Visitor,” like other carved-wood works in the show, seems to draw sinuous hidden forces out of its raw, splintery source material. Webb’s new interest in glass and stained glass, by contrast, is puzzling. His decanters, pickle jars and bowls fiddle vaguely with ideas, but without nearly the sense of transcendence he pulls off with his fir and cedar pieces. Let’s hope this glasswork is a detour and not an abandonment of his strongest suit.